Investopedia defines Compounding - The ability of an asset to generate earnings, which are then reinvested in order to generate their own earnings. In other words, compounding refers to generating earnings from previous earnings. When you lay everything out on the table, this is your final goal with investing - get your money working for you. I have many friends who took this concept and applied it to their careers to make them very successful at what they do. Realtors use it to grow their network, in return accruing listings at a faster rate over time. The more listings they have, the more sales they generate. Some of my friends in sales are making bank on sales networks they’ve spent years building and cultivating. Coming from a programming background, one of my biggest challenges was to figure out how I could apply this concept to my career and skill set. The challenge faced by most programmers, and definitely any programmer that sticks with it for a decade or more, is the limited life for any given language. We are constantly barraged with the next great thing, we get out there and take the courses, read the books only to find in a few years there’s a better way to do task X. In short, reaching that mastery experience for any given language is challenging. This is where the stock market comes in. Concepts that have worked 50 years ago, work today. Knowledge gained can be applied on a daily basis, now and for the rest of your life. As you accrue more knowledge and more experience, this momentum builds on itself making you a better trader and in the end compounding your assets. Taking this a step further, focusing on earnings related trades, such as StockBee’s Episodic pivot or the Earnings thrust allows you to “compound” the knowledge gained on the day of earnings for a later trade when the stock pulls back and then continues forward. First, NFLX announces earnings and provides upward guidance on Jan 27, 2010. Being the diligent investor that you are, you review the earnings release and take note of the fact they had a 62% increase in EPS, 25% in sales. NFLX also raised guidance for 2010. Next, the market responds overwhelmingly positive on the day of earnings with a huge volume and price surge. Wait a minute, at some point we had a discussion over at the Stockbee site about the fact that larger float stocks tend to pullback after announcements so you sit and wait a few days before entering. What did you need to do to acquire this knowledge? Nada, this was knowledge gained back in January and the past few months while watching the stock go up. The stock has already been on your radar for months. At this point, to make a decision to buy or pass on the signal takes minimal effort from you. Compare this to trading diverging strategies where you would have to do a lot more grunt work for each trade to get to the ultimate decision of buy or pass. Most, if not all of your leg work was done up front so the decision process can occur much faster. In summary, a good way to compound your knowledge is to look for strategies that pair together. This allows you to make quicker decisions with more confidence when it’s time to push the buy button. Good point with good example dc. 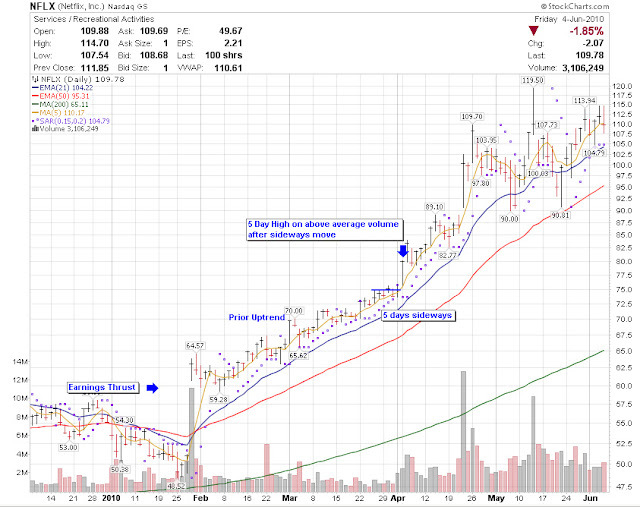 One could have also bought NFLX on first 4% breakout after earnings on 3/1/10. It had all the factors that Stockbee recommends: 10 & 21 days growth < 10%, distance from 6 month high all most zero, volume surge > 100 etc.